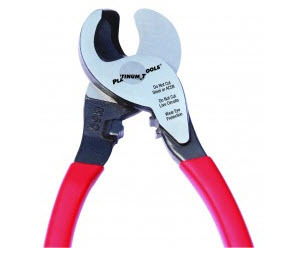 The Platinum Tools 10531C 5" Side Cutting Pliers are perfectly suited for field or production line work. Use for cutting copper wire or trimming leads with the full flush cutting blades. The tool is manufactured from high carbon tool steel, precision ground and hardened for long life. Molded comfort grip handle. Rust resistant black oxide finish. Platinum Tools, founded in 1997, was created based upon two very simple objectives. First, develop, manufacture and source the absolute best possible solutions for preparation, installation and hand termination of wire and cable. Second, implement an operational infrastructure that can deliver these products in an efficient, timely and high quality manner.